My Grandad, Oliver initailly was for some reason in the 1/6th batt Northumberland Fusiliers #65999 and we ‘ve been told he joined up underage (born 30 june 1900 Ashby de la zouch,Leics) and was a runner for the battalion and also that he’d represented the battalion in boxing,there was always mention of a photo and a medal for this sport but don’t know as to where they ended up…have looked into when he was re-mustered into the 2nd Battalion KOYLI #62410 but to no avail…we have his serivce certificate which is surrounded by silk postcards of the era. 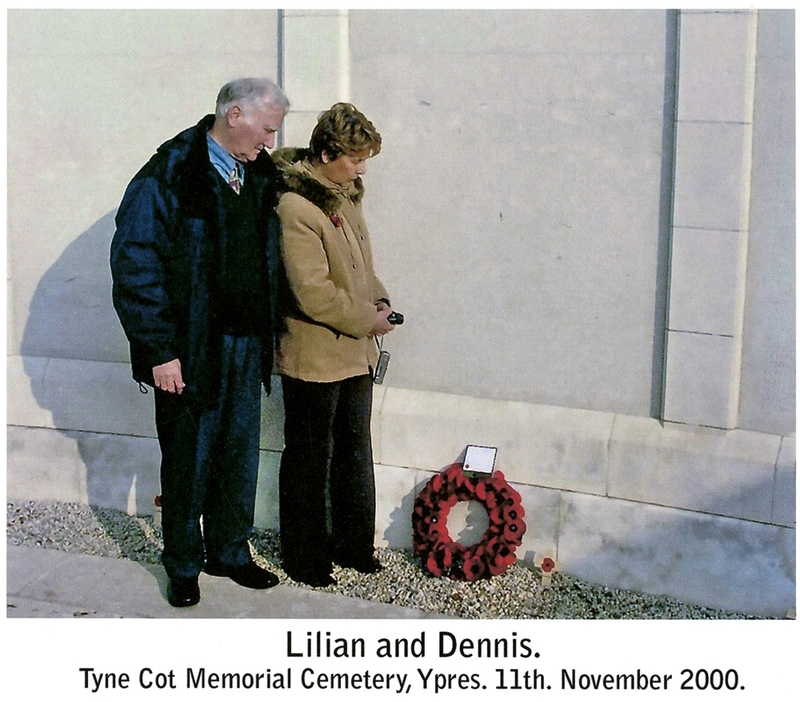 (see pic) we do have a photo of him with two other comrades, but this is whilst he was with the Northumberland Fusiliers. I do have a brass trench art matchbox cover that was His. 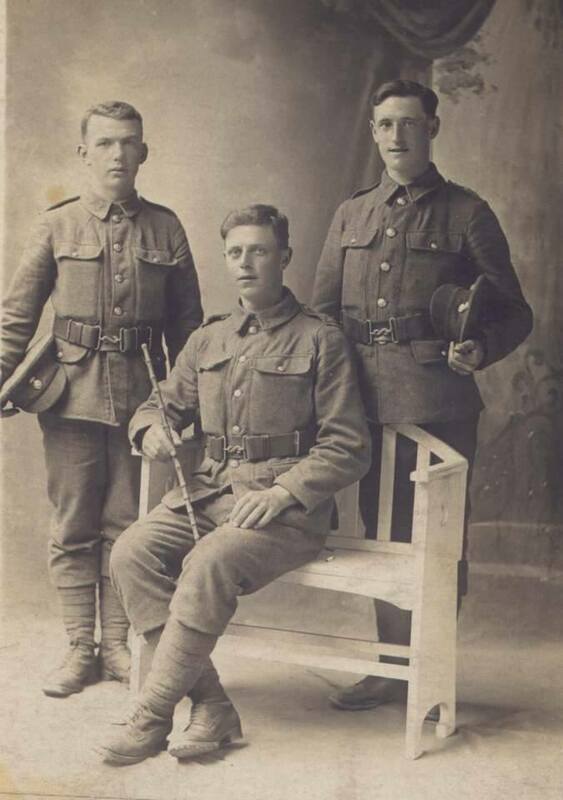 photo o fhim with two more pals is whilst he was in the Northumberland Fusiliers. 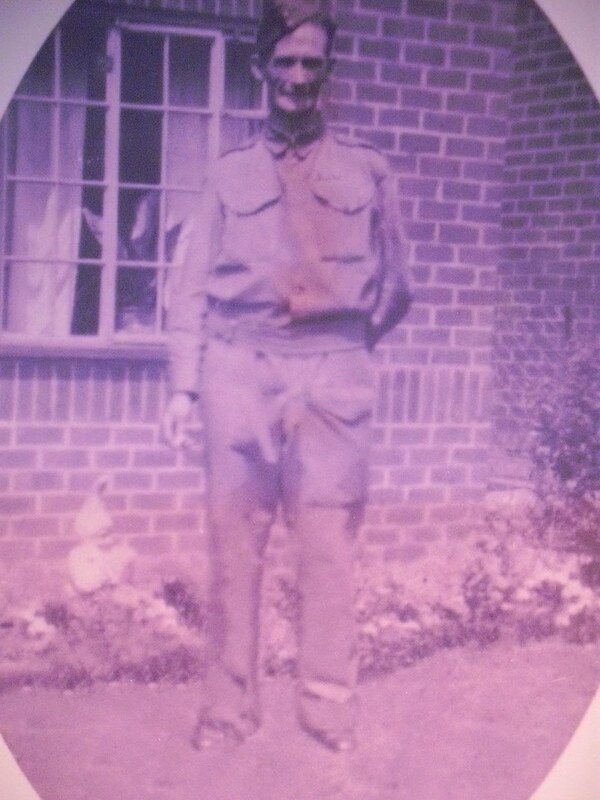 and one photo shows him in his Home Guard days. He passed away in January 1959. Do you recognise this KOYLI soldier? 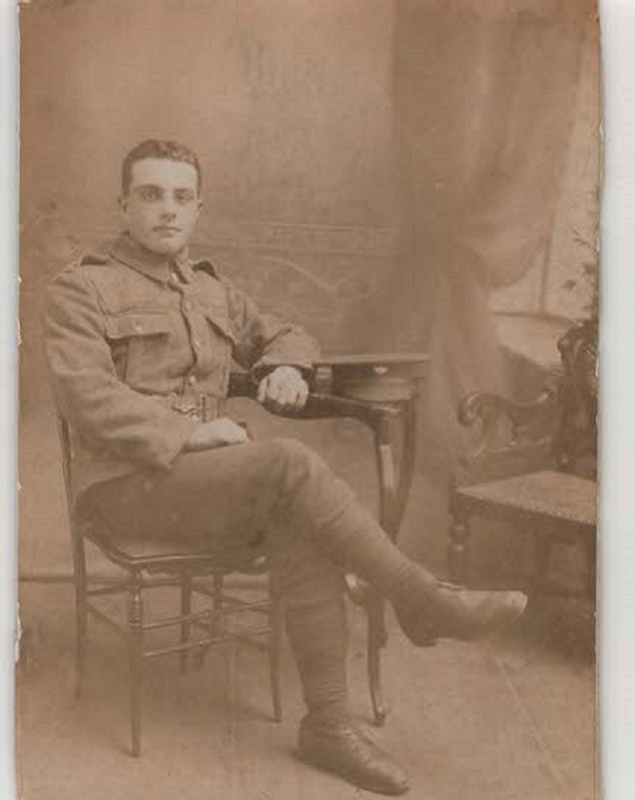 This photograph of a soldier from the King’s Own Yorkshire Light Infantry was found in the collection of a Bradford family. Their family research suggests that, if it is a family member, it could be either Arthur Thompson or Albert Walker. Both were working class types, the former possibly a Dock Worker and the latter a Bricklayer/Labourer. These are speculative suggestions, but possible. As far as we know, both of these men initially came from Goole, the latter being born in Hull – so how one of them might have found their way into the K.O.Y.L.I. ranks is intriguing if true. Other possibilities could be that this man was someone’s sweetheart, but who is a good question. Do you recognise him? If you think you can put a name to the face, please leave a comment so we can find out his story. 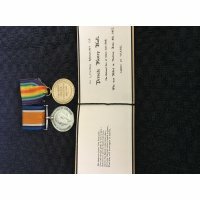 This is a story about a brave soldier who fought for King and Country in the Great War of 1914-1918 and his tragic death 36 years after the war had ended. 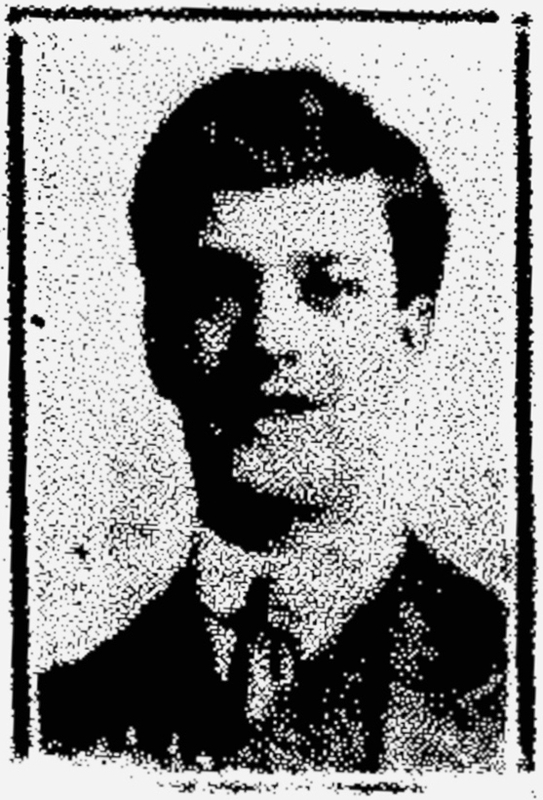 Philip was one of nine children born to Philip and Rose Bedford of New Street Darfield near Barnsley. Description: Phil's brother. Mexborough and Swinton Times. 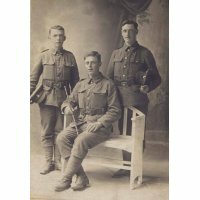 All three Brothers previously worked at the Houghton Main Colliery where they left to join the army and fight for King and Country. 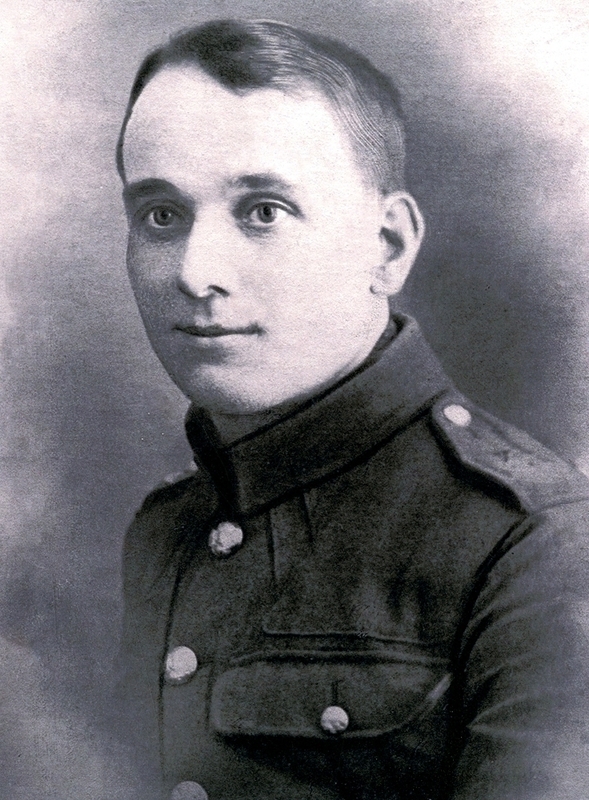 Philip at the age of 23, answered Kitcheners call and enlisted in the Kings Own Yorkshire Light Infantry (K.O.Y.L.I.) 7th Battalion, one of the many coal workers of Yorkshire who were lured by the offer of regular pay, three meals a day and the adventure of a life time with their best mates. The 7th Battalion K.O.Y.L.I. which was formed at Pontefract on the 12th September 1914 became attached to the 61st Brigade and went into training in Aldershot, then onto Witley and finally to Salisbury Plain were the Division was inspected by King George V. and found to be ready for war. The Battalion left Salisbury Plain on the 22nd July 1915 and went by train to Southampton were they boarded the Mona’s Queen, a passenger ship which had been commissioned by the government as a troop carrier for the duration of the war. They crossed the English Channel to Le Have arriving the following day and stayed at a rest camp at Sanvic. 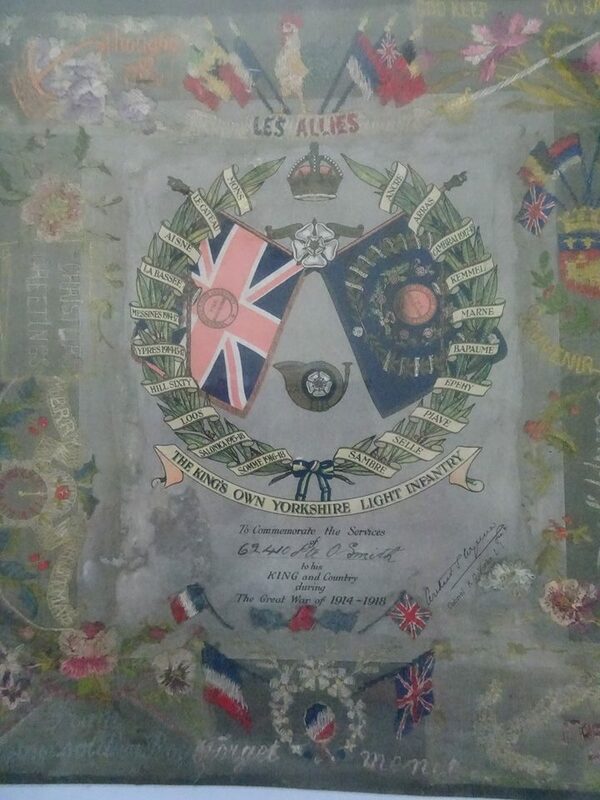 On the 24th July they bordered a train bound for Arques a journey of 182 miles where they went into billets. On the 28th July they route marched to La Creule near Hazebrouck were they rested over night. 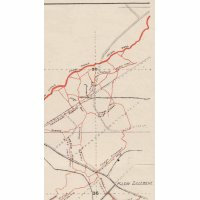 The following day they marched to their destination at Steewerck near Nieppe close to the Belgium boarder, where they received training in trench warfare. This training which would be of the utmost value for their morale, and knowledge of trench routine which ultimately could save their lives. After their training the 7th/K.O.Y.L.I. took over trenches of its own as a fully fledged fighting unit, and were destined to spend the remainder of the war on the Western Front, where they would see action on many famous theatres of war. The trenches they occupied were typically 3 meters deep by 2 meters wide, mostly filled with mud and water. Sanitary conditions were poor, and the Soldiers were unable to bathe for weeks at a time and found it difficult to rest and sleep, they also lived in constant fear of being buried alive by shell fire. The trenches were infested with rats, and many Soldiers suffered from cholera, gangrene, trench foot, and trench fever, if that wasn’t enough, there was always the constant threat of gas attacks, and when it was finally time to go over the top, they all knew that they were forbidden from turning back, and had no choice but to advance. Even their injured mates had to be left where they fell. 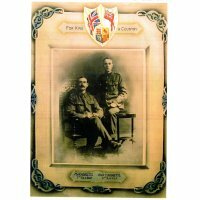 In August 1916, Phil was sent home suffering with trench fever and returned to duty in early September 1916, where the 61st Infantry Brigade found themselves in action in the Guillemont and Ginchy areas of the Somme. The onset of fierce fighting and gas attacks resulted in many casualties, and this is probably where Phil is thought to have sustained shrapnel wounds to his shoulder and back which would cause him pain and suffering for the rest of his life. After treatment he returned to his unit and in October was awarded a Wound stripe to signify that he was a wounded soldier. Description: Phil's brother. Mexbourgh and Swinton Times August 1916. Ironically, two months earlier and just 10 miles away at a Village called Serre, his younger brother Sammy was killed on the first day of the Battle of the Somme on the 1st July 1916. Sammy was just one of tens of thousands of under aged soldiers who joined the Pals Battalions’ for comradeship and adventure, but paid the ultimate price for King and Country. 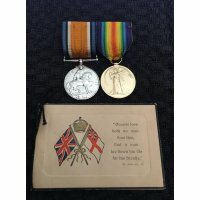 Phil was finally given a honourable discharge on the 29th December 1917, and received the following medals; the Victory Medal, the British Medal and the Silver War Badge, which was awarded to service personnel who had been honourably discharged due to wounds or sickness from military service in World War 1. The lapel badge was made from sterling silver and worn on the right breast of their civilian clothes. 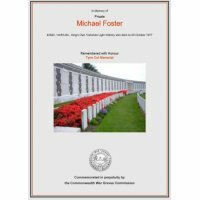 His Battalion went on to fight many heroic battles on the Western Front before it was finally disbanded on the 20th February 1918. Phil returned home and went to live with his Mother Rose Bedford. He was one of many men who came back from the War suffering from serious injuries and the effects of mustard gas and shell shock, better known now as Post Traumatic Stress Disorder. Tormented by his experiences and not being able to return to his former work, family recollections indicate that Phil never fully recovered from the traumas he endured. He suffered from depression and financial difficulties which only added to his already devastated life. Our family have fond memories of Phil, my sister Ann in particular, can recall visiting their house each week and do her grandmother’s hair, whilst listening to her uncle Phil play the organ in the parlour. He looked after his mum for many years through her old age until she passed away at the age of 90 in April 1954. Shortly afterwards in May 1954, Phil aged 63 took his own life while the balance of his mind was disturbed. We can only presume that with the loss of his mum, he lost his will to live and wanted to put an end to his pain and suffering. Whether people agree that this was the right or wrong way for someone to end their life I cannot say. All I know is that I am proud of my Uncle’s for doing their ‘bit’ for King and Country and I am sure if they were around today, they would be the first to volunteer again to keep our Country great and safe for all of us to enjoy. 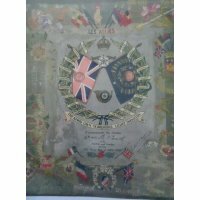 I have dedicated this story to his Regiments Museums Archives who have provided me with the Battalions War Diary’s which has helped me put his story together, for which I am deeply indebted. 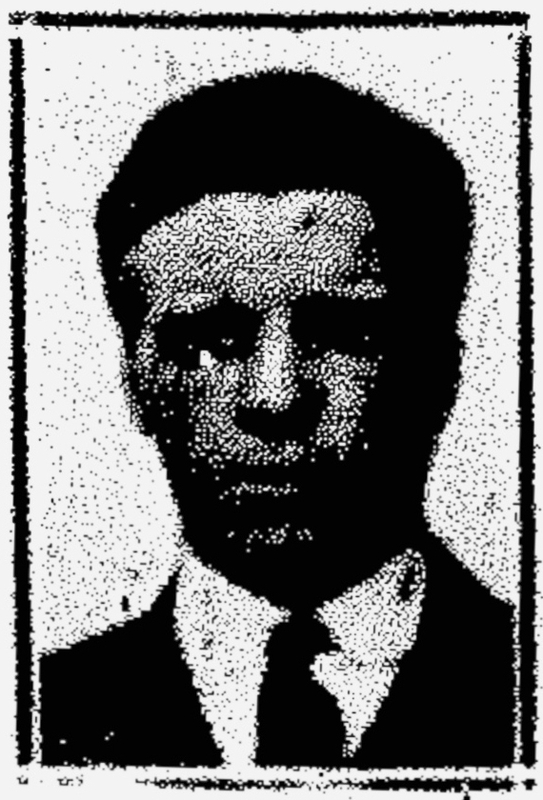 Walter Clempson was killed in action on 3rd May 1917, aged 36. 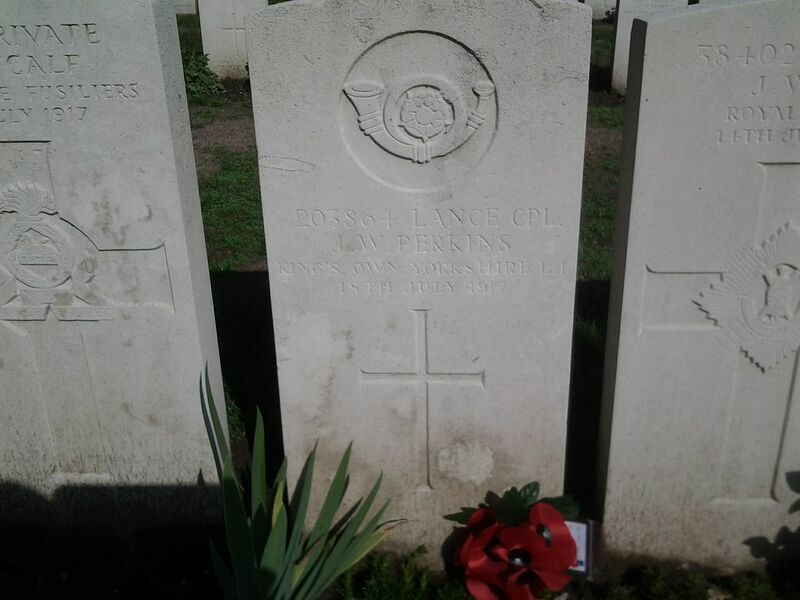 At the time, he was serving with 2nd/5th Battalion King’s Own Yorkshire Light Infantry. Walter’s remains were never found but he is commemorated on the Arras Memorial in France. 1882 – Walter Clempson was born in 1882 in Amington, near Wilnecote, in Warwickshire. His parents were Joseph Clempson and and his first wife Catherine Capenor. 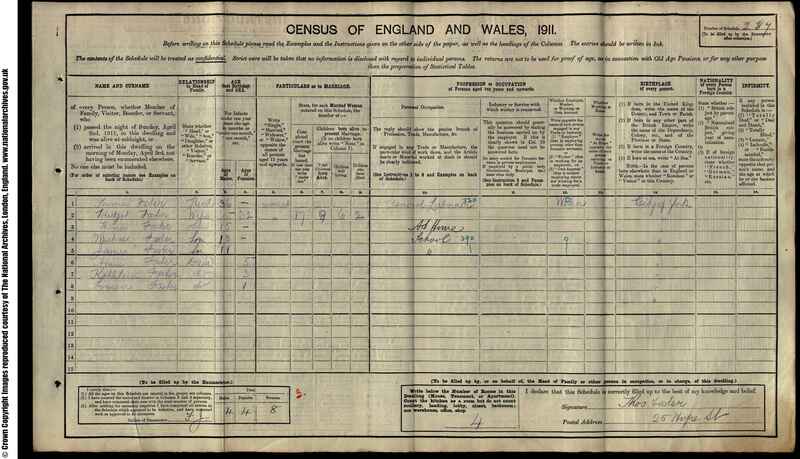 1891 – The national census, taken on 5th April, shows Walter, aged 9, living with his widowed father Joseph, an agricultural labourer, in Amington. Also living in the household were Walter’s siblings Mary Jane (19), Joseph (14), Thomas (6) and Harriett (3). Mary Jane Capenor, who was likely a relative of Walter’s late mother, was visiting the family. 1901 – The national census, taken on 31st March, shows Walter, aged 18, living in Amington, Warwickshire. He was working as a brickyard labourer. Walter was living with his father Joseph, stepmother Jane, his siblings John (26), Thomas (16) and Harriett (14). His stepmother’s children, William, Mary and Eleanor Scott, were also residing with the family. 1911 – The national census, taken on 2nd April, shows Walter living at 221 Dearne Street in South Elmsall, working as a collier, likely at Frickley Colliery. His wife Rose and daughter Lily were living in Kettlebrook. His daughter Violet was born later that year. Fred Valentine Wood was already married with two small children when he joined the K.O.Y.L.I. 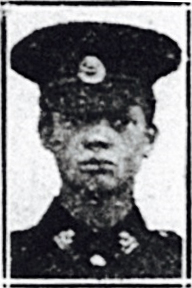 5th Battalion in 1914, Private 240235. He had married Lily Halifax on the 4th December 1910 in Conisbrough, Lily was the daughter to William Halifax a Miner and residing in Hooton Roberts, although she was born in Wickersley in 1877, Lily was a Domestic Servant at the time of her marriage. Fred’s sister Ethel witnessed the marriage. Their children were, Harold born 10th May 1911, Henry born 6th December, 1913, George W. born 7th October, 1920 and Mary born 27th July 1922 (she later married Irving Ellis in 1949). Fred was born 14th February 1890 (according to the 1939 Register) and baptised 4th June the same year. He was the son of George Wood a Glass Blower who later became a Miner who was born in Conisbrough and Mary Ann who was born in Stainton. 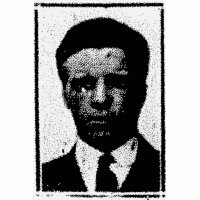 In 1901 Fred was living at home with his parents and siblings at Wellgate, Conisbrough and was a Miner at this time, by the next census in 1911 he was married and was a Sickle Grinder living at 7 Brookes Square Conisbrough. At the time of the 1939 register, Fred was working as a Colliery Wagon Loader and living at 31 Denaby Avenue, Conanby. Fred died on 24th June 1955. 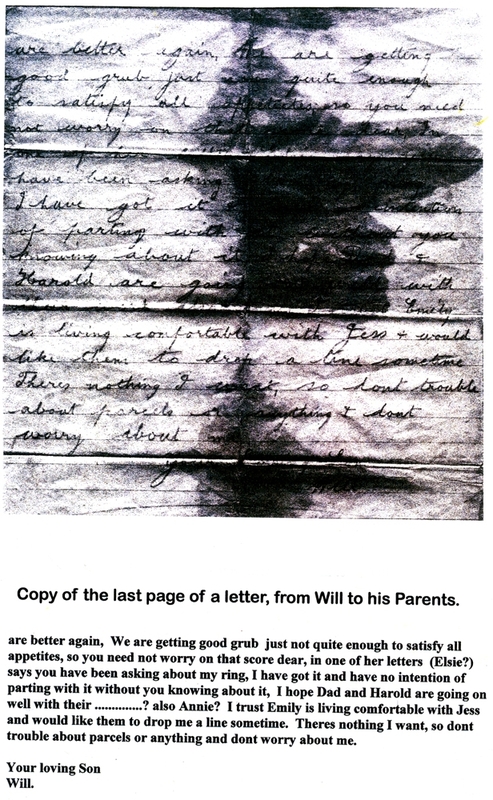 Fred’s story was submitted to us by his grandson, Fred Victor Wood, who was named after him. His middle name is Victor instead of Valentine, as he was born near VE day 1946. Pte Henry Hall , 8th Battalion, Kings Own Yorkshire Light Infantry. KIA Messines Ridge. Henry was born in Sheffield around June 1895. Henrys family lived in the Firth Park area of Sheffield. He had 3 Brothers and 3 sisters. His mother was called Clara who was a widow. 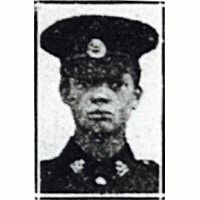 The reason why I’m writing this story is to keep Henrys memory and knowledge of his sacrifice from been forgotten, although he was not from Doncaster he joined the KOYLI who recruited heavily from the area. 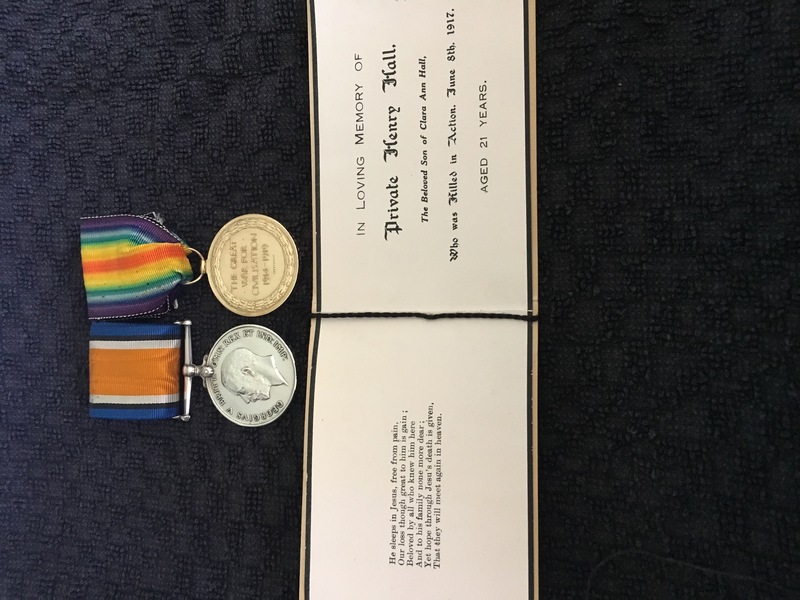 I’m not related to Henry but I was given his medals by one of his sisters Eva, she was my grandparents neighbour and she always said hello when I was visiting. 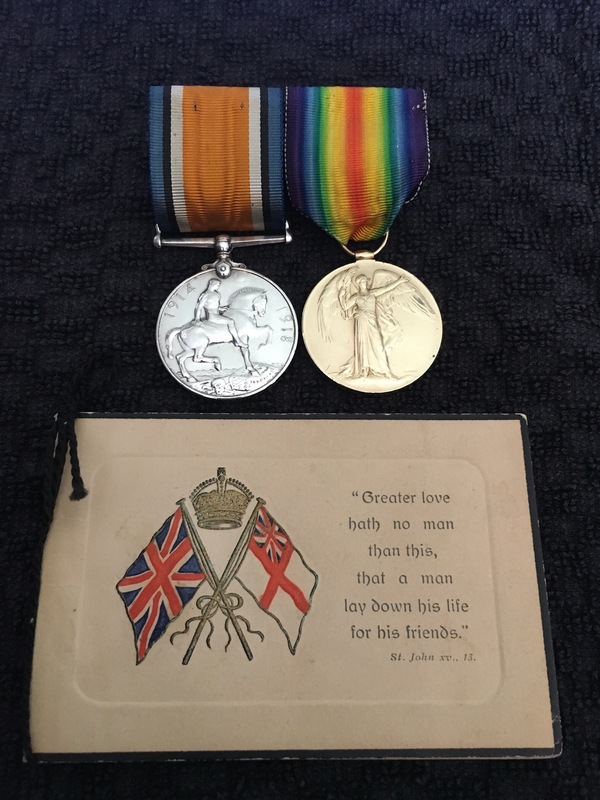 Eva gave me the medals to take care of when I was young and with the First World War centenary Ive completed a little research to find more about Henry and his service in the KOYLI and to do my best to keep his memory from disappearing. 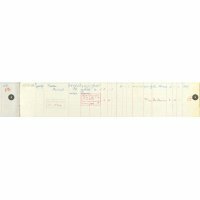 Henry would have joined the Army around May 1916 , there’s no information or evidence about when he joined the 8th Battalion KOYLI as the war diaries of the battalion do not list individual replacements. 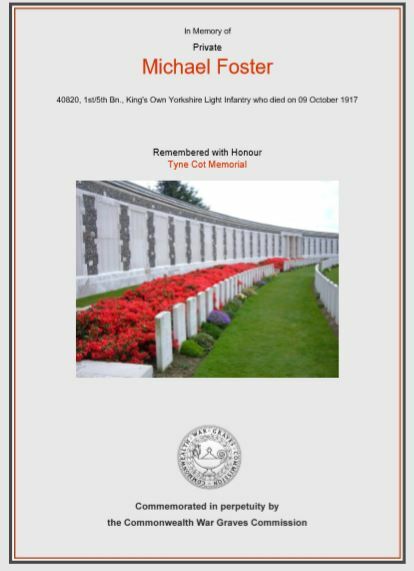 The 8th Battalion Kings Own Yorkshire Light Infantry were part of 70th Brigade in the 8th Division. They were in the area of Hill 60 from 10th May and taking part in preparations for the attack on Messines Ridge. 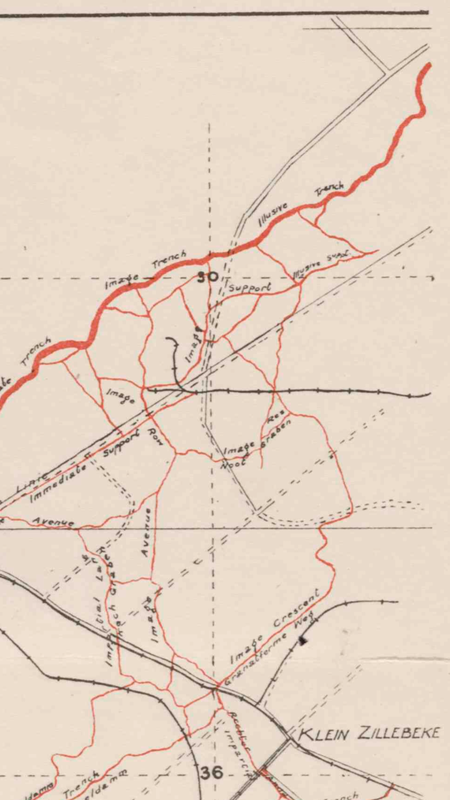 The Germans assaulted the line on the 13th May and resulted in counter raiding by the 70th brigade. The 8th Batt took part in the attack on Messines Ridge on the 7th June 1917 and would have witnessed the large mine explosions at the start of the battle. These explosions rank among the largest non nuclear explosions of all time. The mines exploding at Hill 60 and Caterpillar Hill siganalled the start of the attack. The battalions objective was the German trench called Image Trench and part of Illusive Trench these been the German frontline. The objectives were captured 3hours 40 mins after zero hour and consolidated under the cover of Lewis guns. The 8th Battalion remained in the front until 10th June. At some part of the attack Henry became 1 of 250 casualties sustained by the 8th Battalion Kings Own Yorkshire Light Infantry during the Battle. 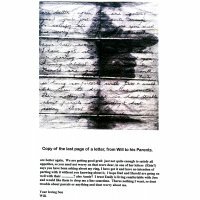 This is the story of William Edward Hodgetts, a soldier of the First World War who has never been forgotten by his family. They love and treasure his memory and are keen to keep his story alive for future generations. Their present day knowledge of the man; his character, emotions and his tragic death has been passed down through the generations from the people who knew him well. William was born in 1893, into a large family where he was the oldest of nine surviving children. They lived in Edlington Street in Denaby Main, where the only work available locally was at Cadeby Colliery. Everyone called him Bill, though he liked to refer to himself as Will. As soon as he was able he got work at the pit to help support the family. He was a bright lad and a very devout Christian, attending the local Methodist Chapel regularly, organising the Boy’s Brigade and arranging outings for the youngsters to enjoy. He and his charges were proud of their distinctive uniforms and were often seen marching with the Methodist band to mark important dates in the Christian calendar. 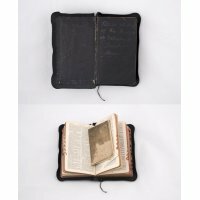 He became a lay preacher, and carried his small black leather bound Bible around with him everywhere, even when he went to work. A red Prayer Book was another treasured possession. He fell in love with the local schoolteacher, Elsie, and the family was delighted when he announced their engagement. However, when war was declared both he and his father were among the first to respond, enlisting in Conisbrough. Arthur was 21, his father, also called William, aged 44. Arthur was attached to the King’s Own Yorkshire Light Infantry, firstly with the 5th, then later with the 9th Battalion. 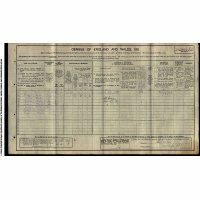 He was shipped out to France in June 1915. 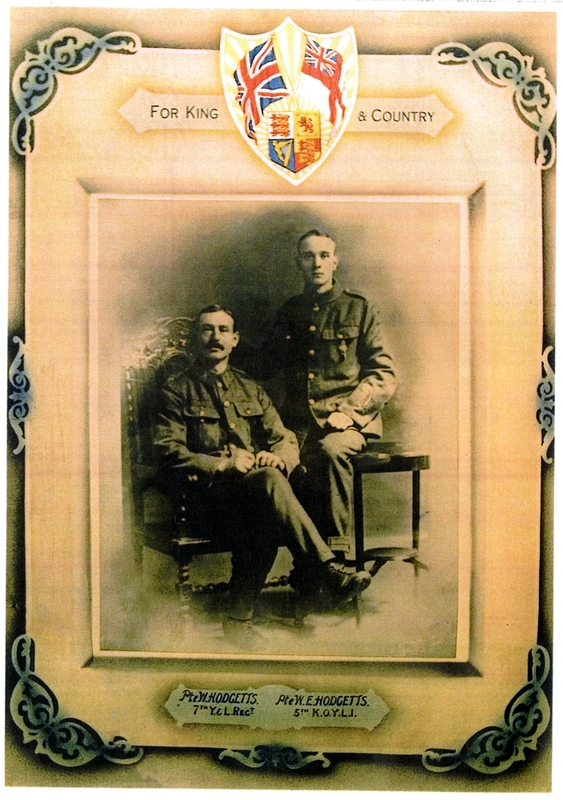 William senior joined the 7th Yorks and Lancs Regiment. Arthur was a good correspondent, always enquiring after Elsie and the family, but never mentioning what he must have been experiencing at the Front. He had one known spell of leave, around Christmas, when he attended Chapel and enjoyed seeing family and of course his beloved fiancée. Later a soldier reported that he had seen Bill badly wounded making his way to the Red Cross Station. But after that he was never seen again. It was thought that being badly injured he must have fallen into a deep, flooded shell hole and drowned. After the war Bill’s father and brother Harold travelled out to the Battle Grounds in response to a request for volunteers to help bury the dead. They hoped to find Bill’s remains while carrying out this grim task but sadly his body was never found. The family never really got over his loss and his fiancée Elsie never married, instead devoting her life to teaching. 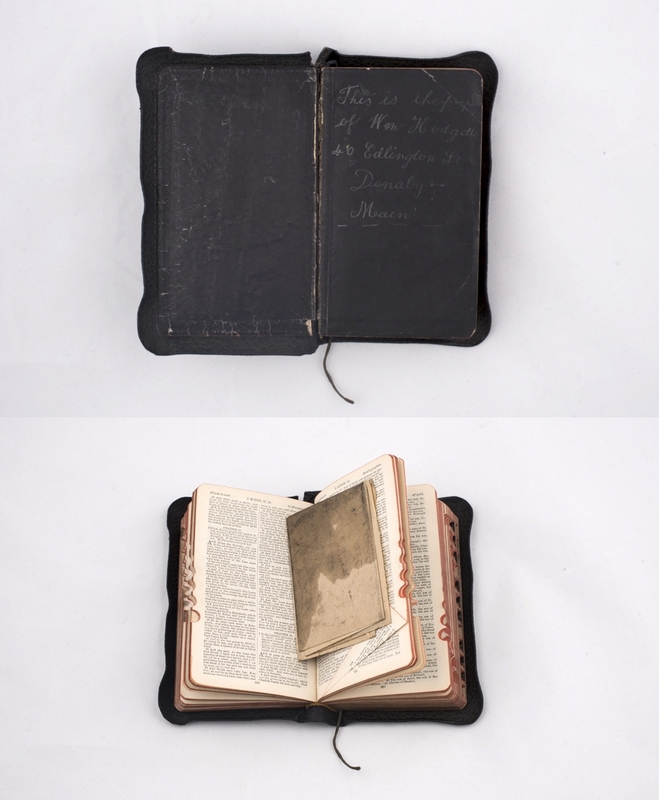 The Bible did come back to his Mother, and that, along with the red Prayer Book, is a treasured keepsake within the family. 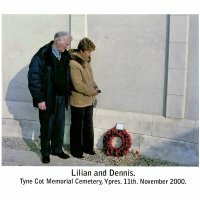 Many decades later, in the year 2000, family members were able to go to Ypres and lay a wreath at the foot of a large stone plaque bearing his name in Tyne Cot Cemetery. May Bill and his comrades rest in peace. Lance Corporal John William Perkins 2nd Bn Kings Own Yorkshire Light Infantry, Died on 15th July 1917 203864 was the son of William and Annie Perkins of Hemsworth, he was born in 1894 in Hemsworth Pontefract West Yorkshire, he had two brothers and two sisters, one of which was my grandfather Frederick Arthur Perkins, when his brother died he was buried in Coxhyde cemetery Belgium. Last year a friend of mine who served in the military as an MP placed a wreath at his grave for me and my family. 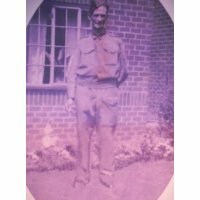 His brother “Fred” missed him terribly and until his death in 1964 had his battledress hung up in a long cupboard in his front parlour, and no one was allowed to touch it.